Got just a couple of days away with bae? Make the most of it at Retreat On Cloud 9, a quaint homestay at Lonavala, surrounded by hilly terrains and green valleys. Retreat On Cloud 9 at Frichley Hill Road, looks like one of those old-school brick houses with a gorgeous courtyard and a beautiful garden full of chickoo, lychee and mango trees. The place is perfect for a romantic getaway, far from the city chaos. The surrounding area, too, is extremely quiet and peaceful. The villa has two gorgeous bedrooms that ensure complete privacy. There is a living room too, tastefully done up with vintage furniture and pastel notes. Apart from this, the villa takes care of all your basic needs - fresh linens, pillows, toiletries, WiFi, TV and air conditioners. 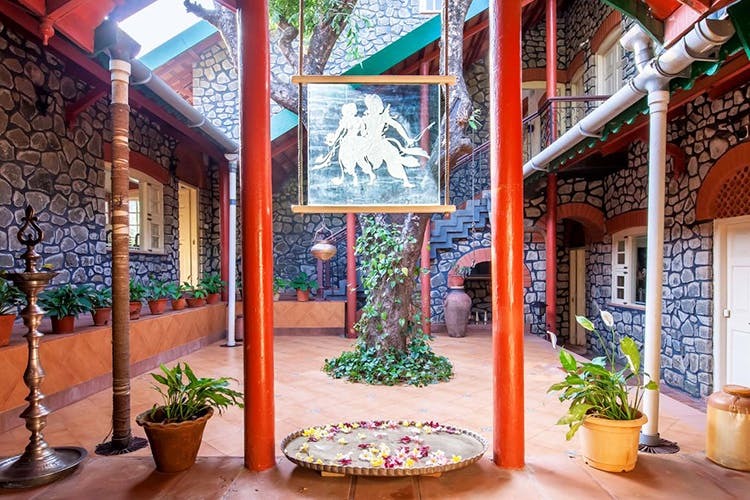 Prices start at INR 14,000 per night, however this keeps changing depending on the season and availability. We hear the owner is quite friendly and stays at the outhouse of the villa. Make sure you have a conversation and get some recommendations on what to do in and around the place. We wished they allowed pets at the villa. The best months to book this villa would be between October and November. The weather will be great and the garden will be in full bloom.